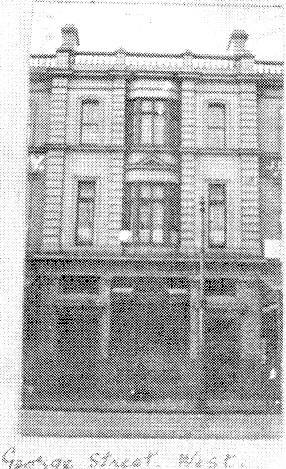 388 George Street is important in the history of the bank, as it set up its first premises there in 1842. 1983 A number of Head Office departments were relocated to the American Express Tower, including Financial Control's Accounting Control, Accounts Payable, Audit, Banksure, FICS, Finance, Financial Planning, Health Society, Instalment and Personal Loans Accounting, Savings Bank Accounting and Superannuation. John Beer advised "388 George St acquired buildings to King St. 388 George St was redeveloped. 388 George St was occupied by CBC departments including GM Finance pending redevelopment of Barrack Street's Lottery Office building which had been acquired by CBC. 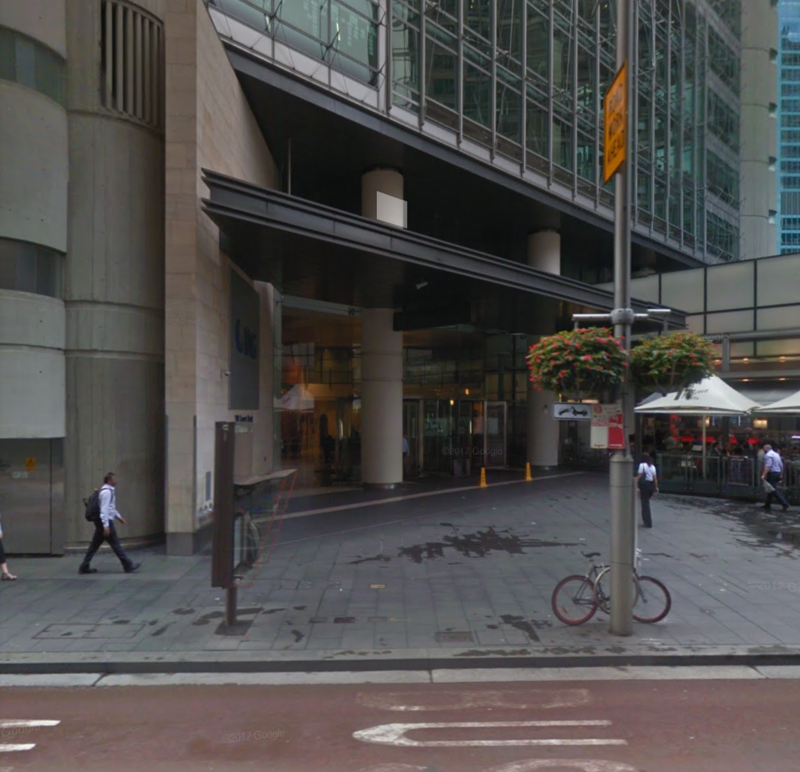 NCBCofS then decided to scrap Lotteries Office instead move to 255 George Street's AMP building known as NAB House 255 George St.
2018 Google photo as 388 George Street is now. 2009 1973 Sub-branch listed in Annual Report, page 37.
c.1896 Robert Ness advises: From memory, the building was constructed about 1896 and contained fittings of the highest order such as marble fire surrounds and rooms of very generous proportion on two levels for the manager in residence. The dining room was particularly commodious. 1934 Listed in Century of Banking as George St West. c.1957 was staff training school run by Mr RG (Bob) Taylor for Junior male officers after they passed 6 monthly probationary period. c.1980 when a floor of CAGA Centre was made available for all training except Managers Courses at Fernleigh Castle. Robert Ness says "The upper floors were vacant when I worked there c. 1966/7 but were originally designed as the manager’s on site residence. Quite large rooms with a dumb waiter linking the kitchen at the lower level to the grand dining room on the 1st floor level at the rear with drawing room at the front overlooking George Street West. The bedrooms were on the top floor. 1979/80 the building was sold to the TAFE and remains in their possession but rented for commercial purposes on the ground floor and I believe, used for office/recreational use by the students union on the other floors." 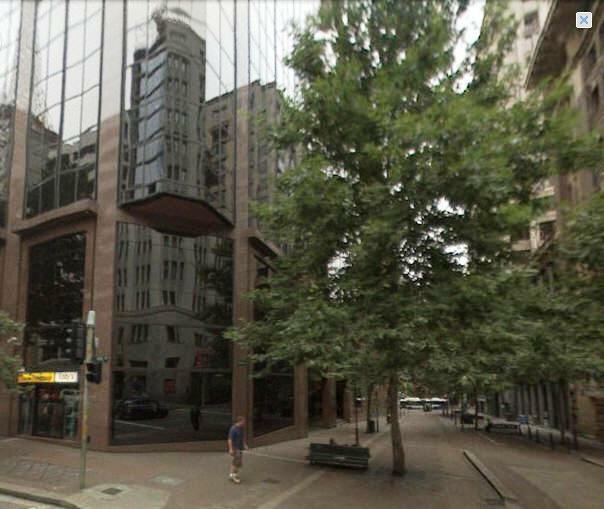 Bill Frost advises: I understand this building was transferred to UTS and the branch transferred around the corner. 2009 July Robert Ness advised "I worked at Broadway branch as a teller in 1968 before taking up position in Premises & Properties alongside Jock Freeman while studying architecture. Broadway branch is still standing and is as you direct, the middle building of three still standing 9-13 The Broadway. 13 was a newsagent and 9 was a chemist back then. Horribly disfigured now compared to when I worked there when the upper level was rented to a bank officer but was pretty much intact from its original condition complete with hand operated dumb waiter from the kitchen on the ground floor to the large dining room on the first floor." John Beer provided Google photo of the site and advised that it is now occupied by 2SERFM. 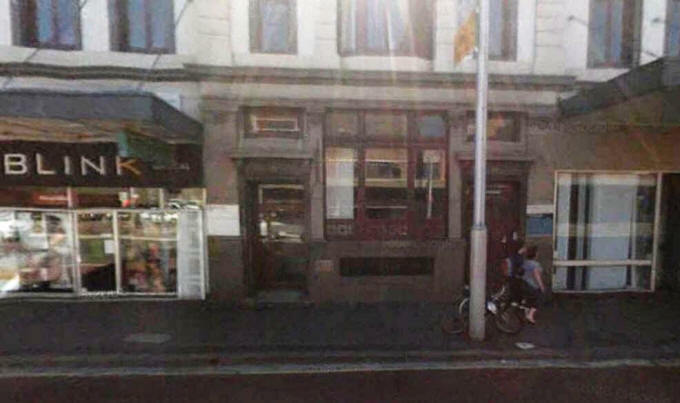 2011 April David Jobson advised: "Ah, the old Broadway branch. Following is an excerpt from my autobio of a few years ago, about my first day at Junior's Training Course in 1958 under Messrs Bob Taylor and Laurie Leeming". After I had completed a few months, I was dispatched to Sydney on the train to attend the Inductees' Training Course. This three-week course was held in a couple of rooms above Broadway Branch and we attended this venue daily having travelled from our accommodation at Mosman. 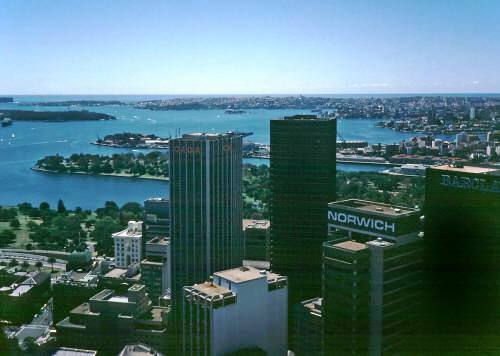 I recall we stayed at a private hotel or boarding house there and travelled by tram down to the wharf at Taronga Park Zoo and then by ferry across to Circular Quay. Our first day to the city was predictably disastrous as, having boarded the City Circle train, we didn't know how or when to disembark so around and around the city circle we went until we finally discovered how to get off. Our group of six (all country kids and inexperienced in the ways of the big city) finally arrived at Broadway for our first day's training at well after 10:00 a.m! Robert Ness adds: This building was never demolished and still stands today but was sold to the UTS by Rutherford (for much less than its real worth) back in the early 80’s. The Bank occupied the middle section with a newsagent to the left and chemist to the right viewed from the street. 732 Harris St, Ultimo 1980 September Branch Managers List recorded as Broadway, 732 Harris St Ultimo. 1981 Bill Frost advises: "I relieved here in May 1981. While here all staff took part in the strike over salaries at that time, the first ever, and it was also successful. I think it was a wake-up call to all banks' management. The new office was lined with diagonal stained knotty pine which in my opinion was revolting." Bounding Bent, Phillip and Young Streets on the site of the Metropole Hotel 1891. 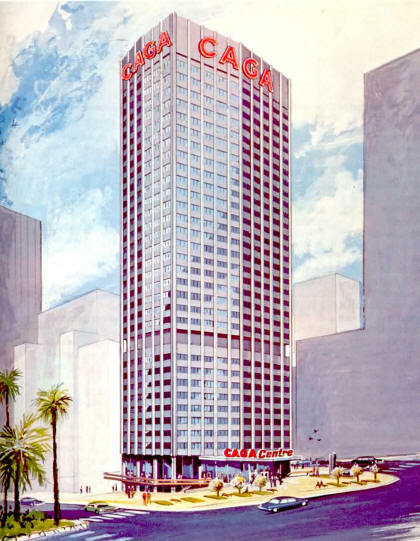 1974 Sketch in Annual Report. 1976 photo from Current Accounts. 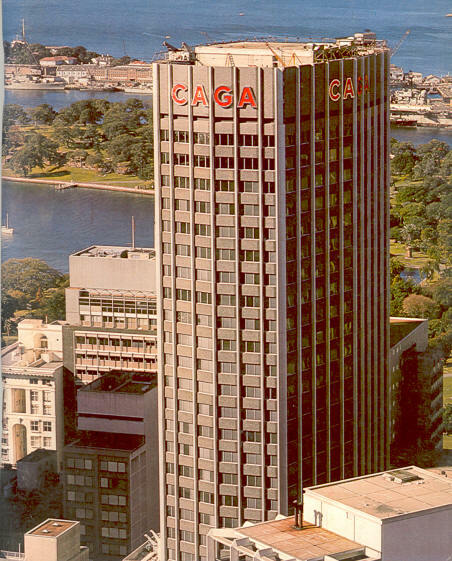 1980 Photo of the ill-fated CAGA Centre, the State Office Block and O'Connell House from Sydney Architecture Images. 2008 March premises refurbished to form part of City Tattersalls Club "Silks" brasserie. H to Z Click at left to continue.